Gisela and Rainer, the proprieters of the Deutsche Gasthaus Atlantis, Playa del Inglés, have extended their trans-American trip to include a stop in San Francisco to visit with us. We had such a grand time with them in "Gran Canaria", and we're absolutely thrilled to see them here. 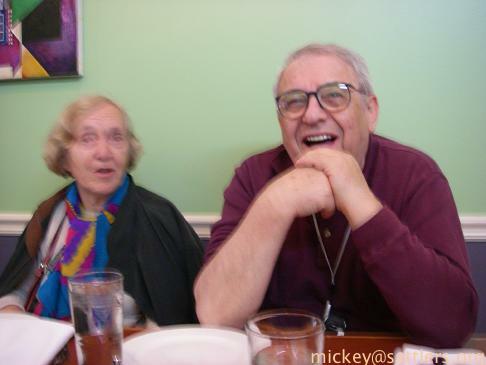 Isaac and Lila are also excited: their memories of working alongside Rainer in the kitchen are comforting and wonderful. A real restaurant kitchen! 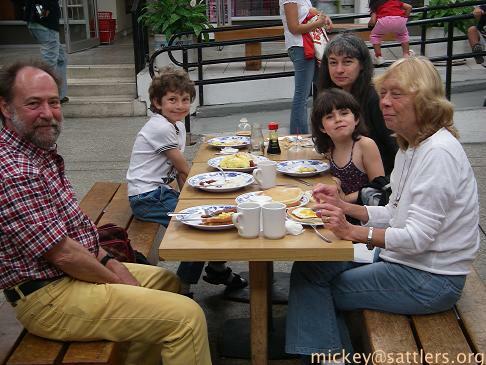 You see us enjoying breakfast at May's Coffee Shop, in Japantown. 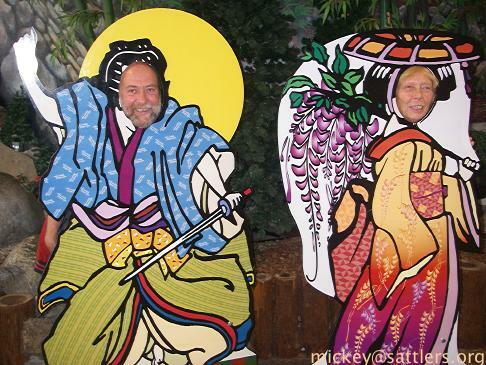 What would a trip to Japantown (during the festivals) be like without posing as a samurai and geisha? 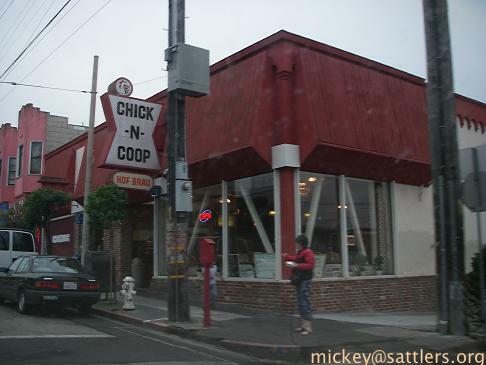 This evening, after a rather exhausting Hapkido, Dziadziu and our family head down Taraval Street to enjoy some turkey. Here's Rose, out front, waiting for Isaac to follow. 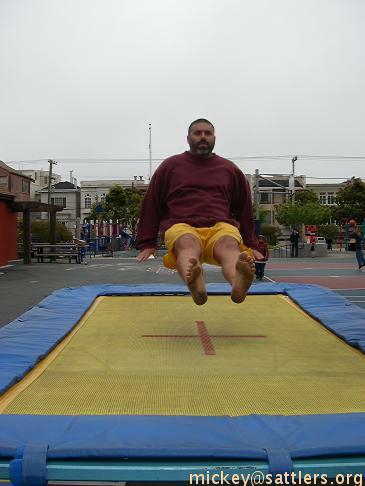 If it's Tuesday it must be time to enjoy the trampoline set up by Coach Larry at Rochambeau playground. This is Lila's discovery, so she goes first. Isaac's been doing this only for a few weeks, but he's taken to the directed bouncing. With the kids having such a fun time it's no surprise that they've asked me to join them. This is me in the middle of a "seat feet knees" direction from Coach Larry. Whereas the kids seem graceful, it looks as though I'm about to land in a merengue. 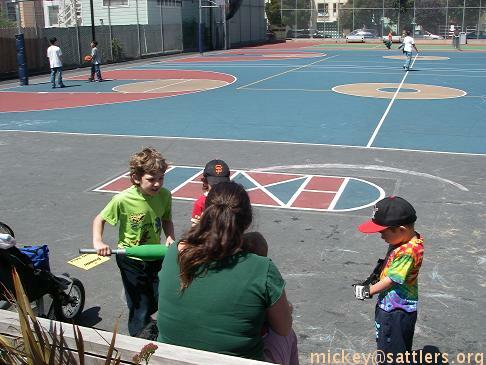 We headed out to the playground rather early (to fulfill our promise to Coach Larry to help him set up while his back recuperates) so we had only a snack breakfast and are hungry for an early lunch. We head around the corner to a cute near-by café for bagels, cream cheese, and a view of the locals. 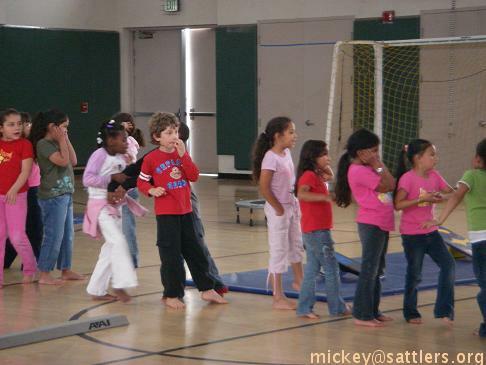 Circus arts, or try-outs for A Chorus Line? You decide. A wonderfully hot day, complete with free mass transit courtesy of the state (via their Spare the Air day program). Here's the Bay Bridge from the Oakland-Alameda ferry. I'll spare you all the mass transit details, save to share that we've enjoyed the ferries, MUNI, BART, and even CalTrain. 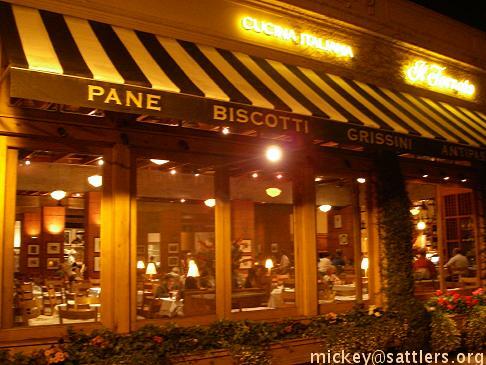 In the evening, exhausted, we visit Il Fornio in Burlingame. 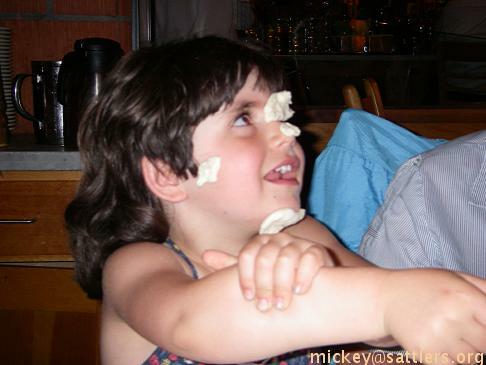 Keeping the kids happy and behaving in a restaurant is always a concern, especially when they're dog-tired. Luckily the restaurant has a novel solution to child management: they bring out balls of pizza dough for the kids to play with. 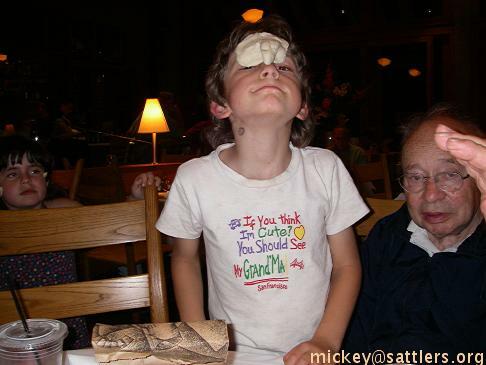 Even Isaac, who - like I did as a child - has "ants in his pants", had a great time with the dough. The kids were great, the food was great, and the company was great. Here's our view of the stage at the Sigmund Stern Grove concert festival. 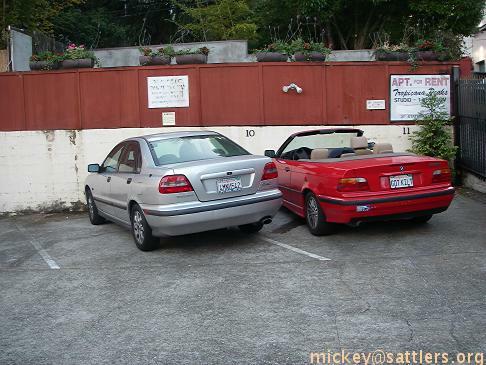 Our party is at left. Today we're here to enjoy Amadou and Mariam and Otis Taylor Band. Here's what the parents look like to the kids. Not too bad. I don't particularly care about seeing the performers, at least not for much of the time. I'm quite happy to lie down and quietly listen to their music. I'm amazed at how many people feel a need to sit (or, worse yet, stand). But that's just me. Today is a day for which the kids have long waited. 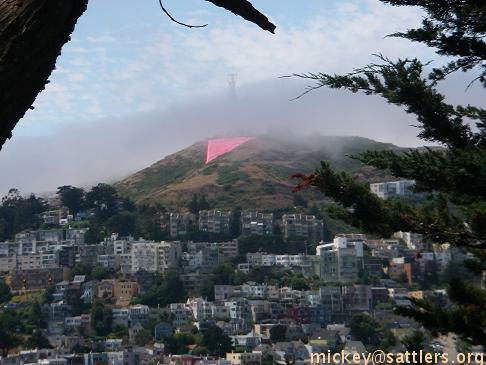 Today we once again help with the installation of the Pink Triangle atop Twin Peaks (part of the Pink Saturday portion of the Gay Pride Parade weekend). 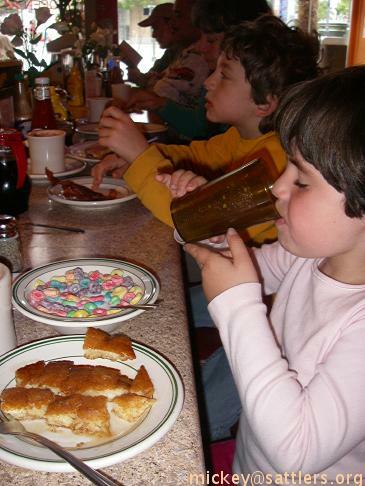 We have to be there very, very early, so I opt to skip making breakfast for the treat of visiting Orphan Andy's, our 24-hour diner in the neighborhood. 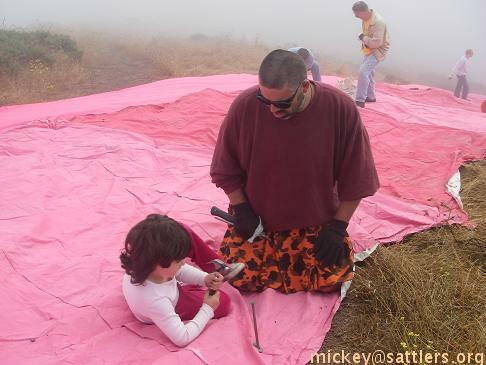 It's a very thick fog which surrounds us as we clamber onto the hillside with our tarp, huge nails, gloves, and hammers. 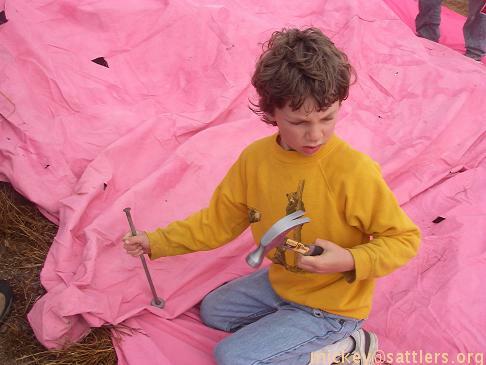 Here's Lila pounding a nail, securing the tarp. 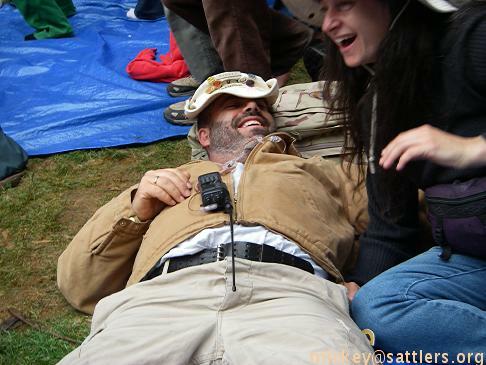 Isaac works near-by, placing a nail into a convenient grommet and getting ready for some pounding. Isaac is especially social during work events like this one. The coffee and donuts (graciously provided) having been enjoyed, the hard work having been done, it's time for the dignitaries to show up. The carpeting and podium are placed, and the arc of balloons is anchored. I think that's Patrick Carney, the founder of the event, behind the podium. 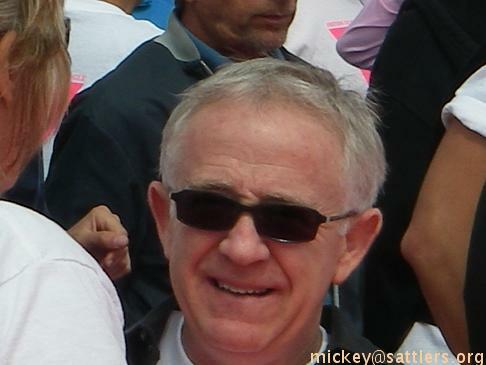 Actor Leslie Jordan, from the television show "Will & Grace", gave a great speech entitled "History of the Pink Triangle". 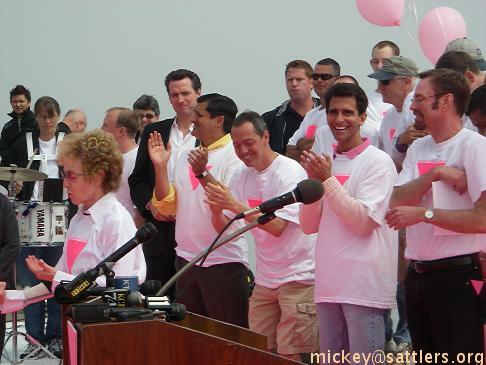 San Francisco Mayor Gavin Newsom, State Senator Carol Migden, Assemblyman Mark Leno, Supervisor Bevan Dufty, and Treasurer Jose Cisneros were among the guests. The 11th Pink Triangle installation is complete. We're satisfied. From our back-yard we gaze up with glee as we see the fog receding and the triangle peeking out in all its glory. I'm told it can be seen from twenty miles away on a clear day. The day is a blur of chores, laundry and tidying, until the evening. 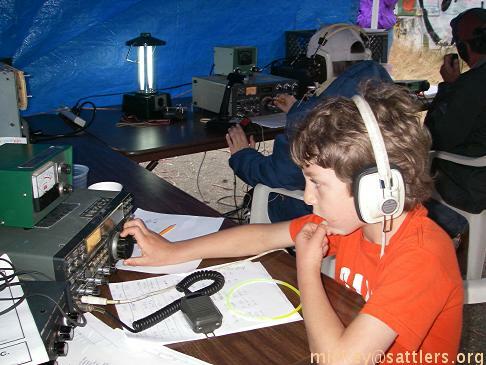 Then we connect with Alpha Ranger Domo and head to the western edge of the city to participate in the annual AARL Field Day Amateur (Ham) Radio exercise and potlatch. 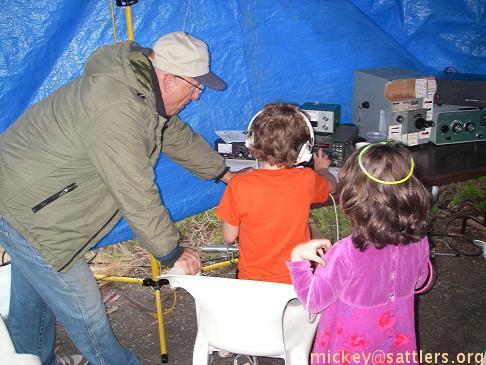 Here's the kids inside the tent, with Isaac exploring one of the longer-range rigs; I'm a hand-held local kind of guy. It's hard to tell with the flash, but it was dark, and that's a glow-stick necklace atop Lila's head. It's now rather late evening. 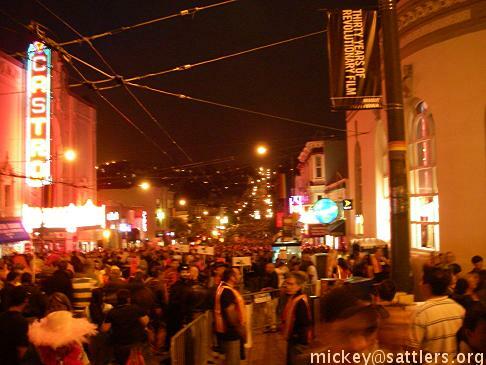 As we park we hear the roar of the crowds enjoying the Pink Saturday festivities. Lila wants to head into the mêlée; Isaac doesn't. We split up. Here's the dancing mob, enjoying the band playing on the stage set up in the middle of Market Street. If it's a Spare the Air day it's time to be out on the open water, right? 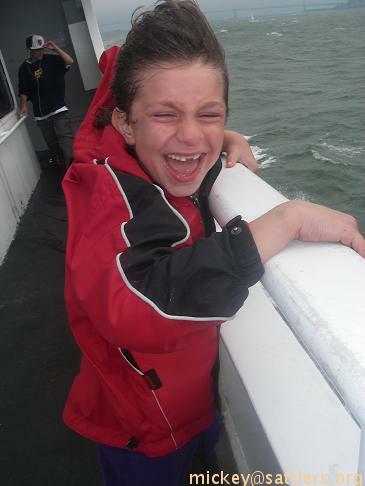 Here's Isaac screaming with joy in the strong wind pushing against the ferry as it heads toward Sausalito. That's the Golden Gate Bridge in the background. (I had to stay home and work. All pictures by Rose.) 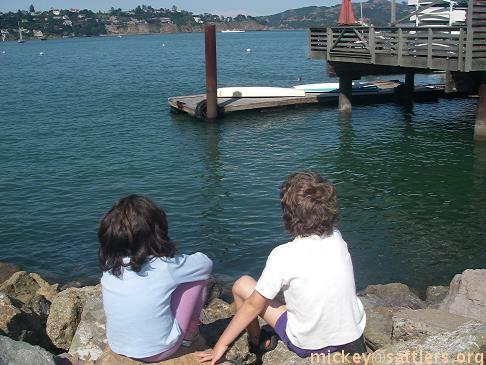 Here's the kids on the Sausalito waterside, checking out the local boat dock. Bubbe and Zadie join the family. 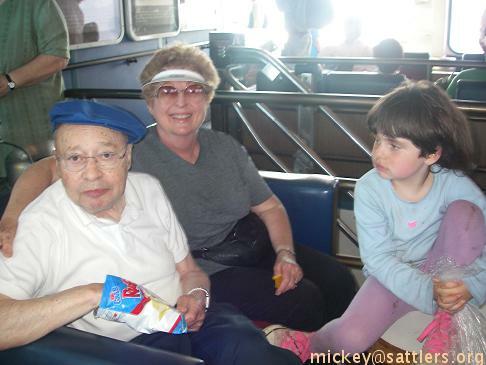 Here they are on the ferry. 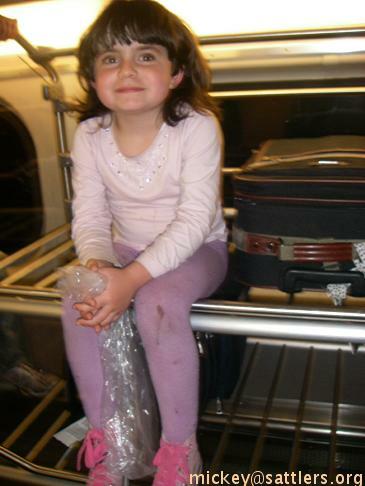 Here's Lila sitting on the luggage rack of the CalTrain. On a free day we drop everything and range far and wide. We love the Bay Area! It's a really hot day, about 92° F (33° C), with clear skies and a bright sun. I call Omi Marga, in Munster, and she tells me that it's even hotter there! She's on the balcony, in a bathing suit, hosing down the plants and herself. 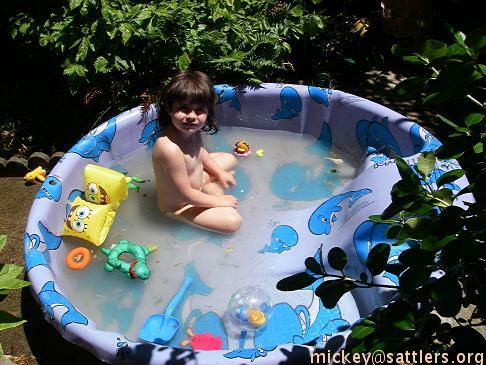 Lila decides the right way to beat the hit is in our wading pool. 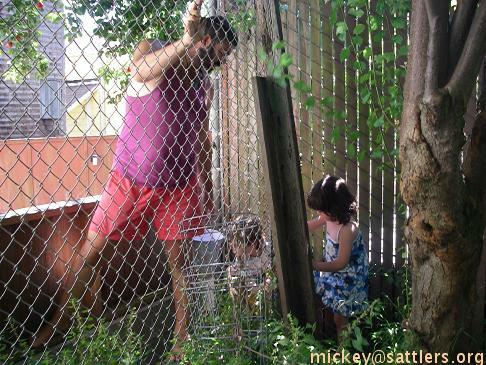 In the late afternoon, after the heat has broken, we head into the garden to harvest the plums from our tree. (You can see a few plums at the upper left of the photo.) Damn, they're tasty! Another beautiful morning at Rochambeau playground. 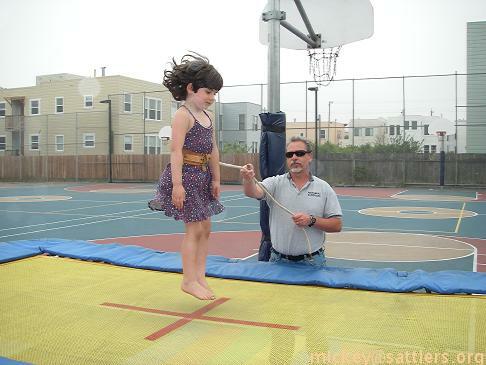 We came for the trampoline but all the pictures I chose are from the other friends and activities; so it goes. 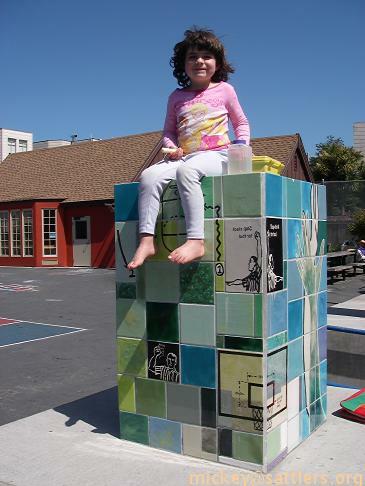 Here's Lila, with her lunch-box and water bottle, atop one of the two pillars in the playground. She figured it was a good vantage point for lunch. Isaac decided he'd rather watch (and then join) a family baseball event. (I'm amused when he's so extrovertedly social.) The game went on for a good long time; nobody wanted it to break up. 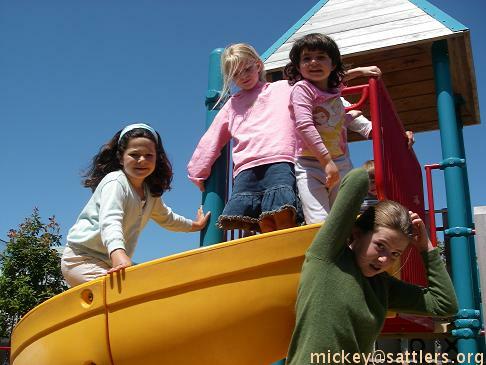 Lila, always social, wound up on the climbing structure with three other girls, and proceeded to have a quarter-hour of follow-the-leader, complete with laughing and screaming. 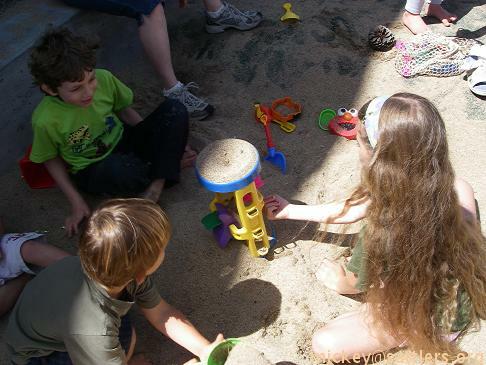 Here's Isaac directing sand play with some kids I think we knew. I'm not sure. This, in turn with the swings, all kids taking turns, was the rest of the play-time. 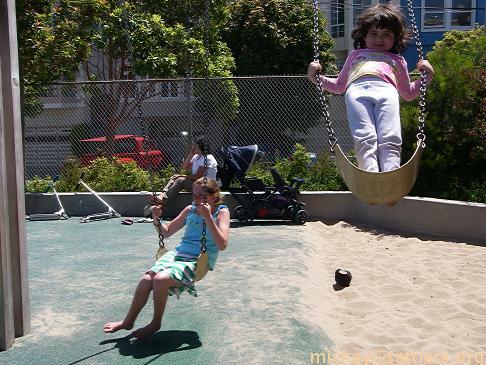 Speaking of swings, here's Lila having her turn. She's getting (more) fearless day by day. Lila is a fashion queen. 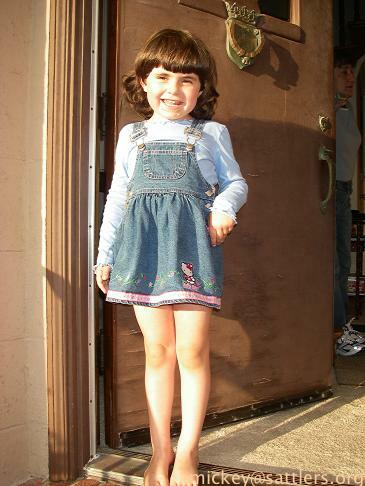 Just as Isaac always loved jeans (at the expense of all other kinds of pants), Lila loves skirts and dresses. 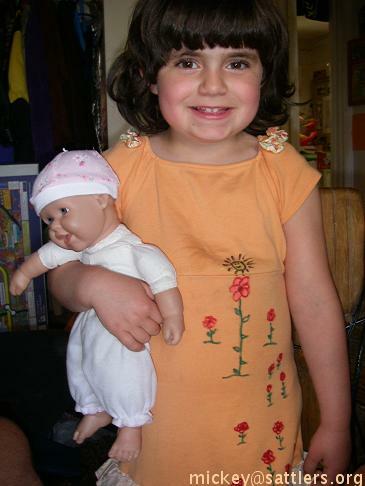 This one, with pink roses atop the shoulders, is a favorite. But what to do when there's a stain that just won't come out? Rose came up with a good solution: draw flowers to cover the stain. Pink flowers, so it was acceptable to Lila. 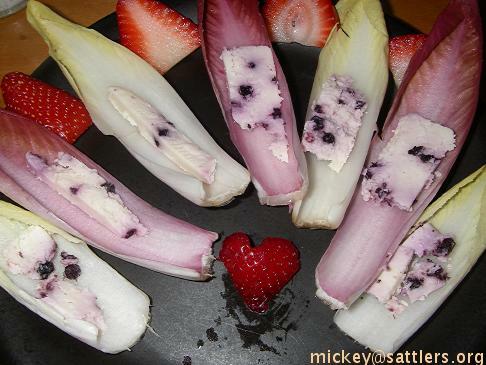 For my dinner I rated a beautiful salad from Rose, who included a strawberry heart. Aww. The blueberry goat cheese was great. It's time for the annual Ranger Orientation Meeting, or ROM. Before we head out to the Burning Man offices we need to eat, right? So a bunch of us head over to The Ramp, a near-by café right on an old boat dock with a working boat restoration yard next door. From left it's Ranger Tool, Dirtwitch, Dirtwitch again, and Tony Danza. 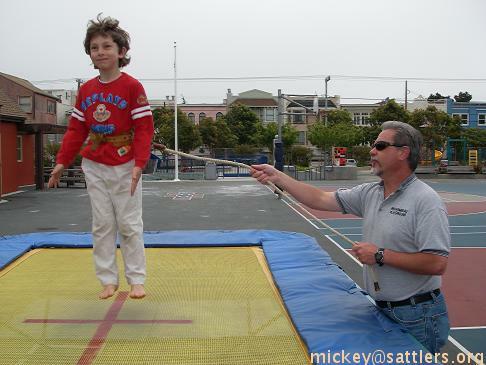 Some of the Rangers have served for many years, and have gone through many ROMs. From left it's Tony Danza, daMongolian, and Tool. 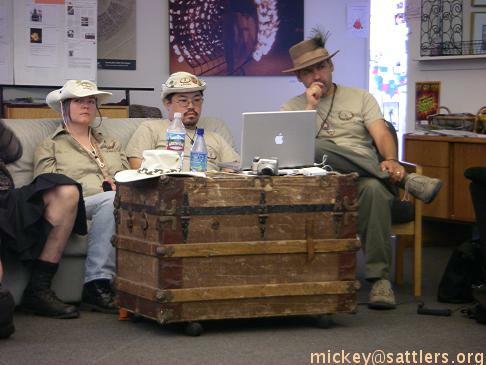 Here's Dirtwitch (our trainer) presenting, with LongPig (second from right) (our mentor leader) behind. One of the most-remembered things at each ROM is the "change something" exercise. I won't spoil it for you, if you haven't been to a ROM, but if you have you'll get a chuckle from this photo (I hope). 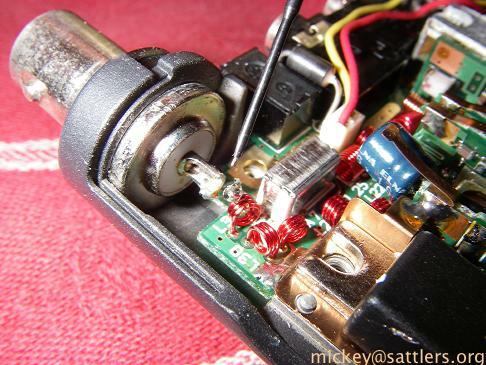 Here's how I fixed the Kenwood TH-78 antenna mount flaw that's plagued my ham radio for almost ten years. Now both of mine work! I can't believe how easy it was, albeit nervewracking. 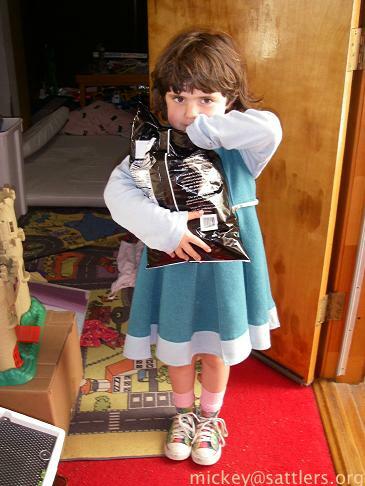 Lila went shopping at Trader Joe's with Rose and dug into the spoils of her trip: cheddar popcorn, I think. 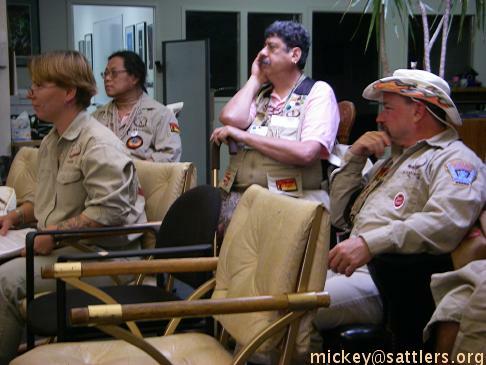 Some of the Rangers - the non-confrontational force for good at Burning Man - meet at the Lanesplitter Pub in Berkeley (University at San Pablo Ave.). 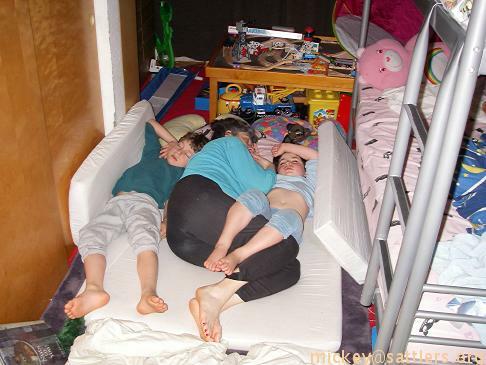 Our family has always enjoyed our "family bed". Now each of the kids has a bunk bed (at right) and sometimes I spend a few hours on the floor, after a child wakes. So what do I see upon my return? The g'rents ask to keep the kids for dinner, so Rose and I get to have an adult dinner with my Dad and Zofia (at Bursa Kebab, West Portal).